User account – Sending’ reported error (0x800CCC13): ‘Cannot connect to the network. Verify your network connection or modem. This issue has been fixed in the November 10th, 2015 Windows 10 updates here. To confirm that you have the fix, make sure you have Windows 10 Enterprise and Pro version 1511 (Build 10586) or higher. For Windows Home, make sure that you have Version 10 (Build 10240) or higher. If you're not able to install the update or the issue isn't resolved after the update, use the workaround below. 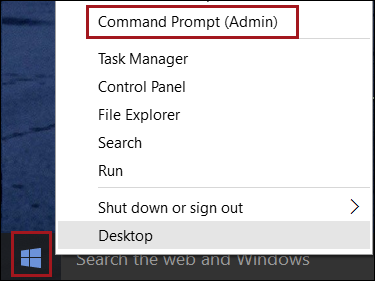 Right click the Start button in Windows and choose: Command Prompt (Admin). If you don’t see that option, instead choose: Windows PowerShell (Admin). In the Command Prompt window type: sfc /scannow (note the space in the command). Restart your computer and then open Outlook.